How To Make Online Rental Agreement In Himachal Pradesh? Himachal Pradesh also called as Deva Bhoomi, a state in the Northern part of India. Due to its pleasant weather condition, it has become one of the most famous tourist spots. It covers a region of 55,673 square kilometers with 12 districts. The state has good availability of electricity. For industries improvisation, the government has brought many incentives like Credit facilities through the state government and nationalised banks and cheaper power which in turn pulls the people to the state for employment opportunities and creates the need for property renting in Himachal Pradesh. Rental agreements make the process clear and straightforward and this will be secure for both owner and resident. The rental agreement is a contract entered between landlord and tenant thereby the landlord gives the right to use the residential premises by the tenant for the period agreed upon. The rental agreement is a legal document which preserves the interest of both landlord and tenant. The rental agreement is a tool which protects the tenant from evicting during the tenor of the agreement by landlord. By entering into a rental agreement the landlord can safeguard himself from any unlawful acts and misuse by the tenant, vice versa the tenant can safeguard himself from any mischievous activity of landlord related to the deposit amount which needs to be returned when the rental duration gets completed. Normally, landlords ask for 10 months rent as advance deposit, which needs to be returned at the time of vacating the property and two or three months prior notice should be given to the landlord by the tenant if he vacates before the agreement period. Everyone knows that giving premises for rent is not an easy one, should find the correct person who pays the rent and maintenance fee on time, should keep the premises well maintained, vacate the building after the agreed period or renewal of the agreement. 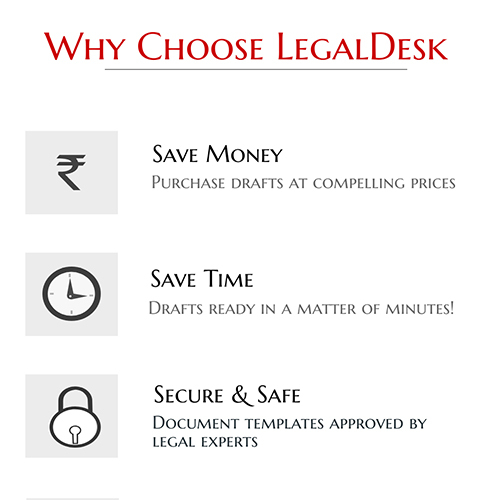 Previously it was time-consuming, tiresome and should seek the help of a legal expert when people are not aware of the proper execution, but it has become easier, hassle free, and time-saving by seeking the help of Legal Desk.com. Now it is easy to make a rental agreement in minutes with the help of Legal Desk.com. It is not mandatory to have the rental agreement in writing but it is highly recommended to do so. The rental agreement must be in writing to avoid any disputes or misunderstanding or in maintaining the healthy relationship between landlord and tenant. Once the contract entered into a written agreement with all terms and conditions included, both the landlord and tenant tend to adhere the norms entered therein. It is a kind of cautious approach. Before drafting the document, the landlord and tenant should make a note of the points and the details which have to be included in the rental agreement. The document needs to be reviewed after drafting it. Once the draft is ready, print it in the appropriately valued stamp paper based on the rent to be paid and deposit amount. Instruments chargeable with duty should be duly stamped as per the section 52 of the Stamp Act, 1949. The landlord has to make sure that the rental agreement is duly stamped as per the law. Generally, two copies will be signed, one copy is for the landlord and the other copy is for the tenant. The Stamp duty for the rental agreement will be calculated on yearly rental and the duration of the agreement. The rental agreement printed on stamp paper with appropriate stamp value is a must and acts as an evidence in court. Both the landlord and tenant have to sign the agreement in the presence of two witnesses who are not beneficiaries of the property. Attestation can be done easily if all the required documents are available at the municipality office. Landlord and tenant presence is must along with their Identification proofs and 3 copies of the rental agreement. 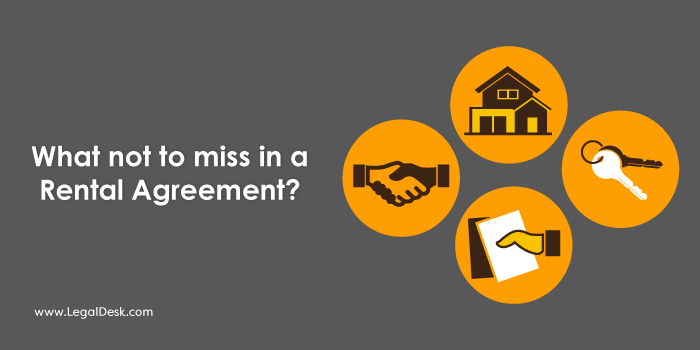 As per the registration Act, it is mandatory to register the rental agreement having a tenure of more than 11 months. Rental agreement registration requires payment of Stamp duty and registration fee. Rental agreement has to be printed carefully and registered in the sub-registrar office. Sub-registrar office differs from region to region and stamp duty differs from state to state as per the Stamp Act. The Government has expressed, the District level Market Valuation Committee to assess the real value of the property and fixed the rates for one Calendar Year. The Stamp Duty rates chargeable in all other documents have been provided in Schedule I-A of the Indian Stamp Act, 1899 which is at page 783 of H.P. Land Code. As such the rates of Registration Fees are given in the Table of Registration Fee at page 843 of Code ibid. Every state government has passed certain rental control laws to prevent the tenant being expelled except defined reason or overcharged by the landlord and to preserve the landlord from any unfair activity of the tenant or if the landlord requires building for his personal use. The law has also specified the maximum rental rate. Landlords are bound to abide the rental control laws of the government if the rental agreement contract is for 12 months or more than 12 months, but some landlords draft the rental agreement only for 11 months to avoid or skip the rental control laws. Both the tenant and landlord get more flexibility in 11 months rental agreement, the landlord can fix the rent and specify the terms and conditions as per the market scenario. In general, the duration of the rental agreement lasts for 11 months. To avoid the rental control laws, landlords prefer for 11 months rental agreement, since there are certain rental control laws announced by the government to save the tenants from unfair acts by landlords. It can also be entered for a week period or month period and both the parties are bound to adhere to the terms and conditions of the contract. Registration is mandatory for rental agreement with a duration of 12 months or more than 12 months as per Registration Act, 1908. So people normally go for rental agreements for 11 months. It has to be verified, that the landlord is the legal owner or he is a legally authorized person to enter into rental agreement. The amount of rent to be paid has to be clearly mentioned. The mode of payment, date of payment and interest if any for late payment of rent. The period of tenancy needs to be included. The security amount, repayment of security amount and lock in period. The person responsible for paying the Electricity charges, Water bill, Maintenance charges. In case of a furnished house, the details of furniture and fixtures, the penalty for damages has to be mentioned clearly. Conditions of Ceilings, Walls and roofs need to be captured. The purpose of tenancy, either commercial or residential. Procedure in case of premature termination of the contract. Renewal norms after the expiry of contract. Rent escalation clause, if any – Tenant should check the agreement if any escalation clause has been included by the landlord, which means the landlord may increase the rent in between or after a few months. Keeping pet animals on the premises. Police verification secures the landlord from giving the premises to the person who is having any criminal background and also can have a background check of the tenant. For police verification, the landlord has to fill in the prescribed application form and submit to the nearby local police station accompanied by tenant identification proof. There are 0 comments on "Rental Agreement In Himachal Pradesh".